On the surface, Otto Gramm was a respected businessman and prominent citizen in Laramie, as well as a public servant. In 1870, he purchased Dr. Finfrock’s, a successful drug store in Laramie. In 1880, he added a soda fountain, which became a longtime fixture in the Laramie community. Gramm later opened the first bottling company in Laramie. A Republican, he served as probate judge in Laramie, treasurer of Albany County and was appointed State Treasurer in 1890, a position he held through 1895. 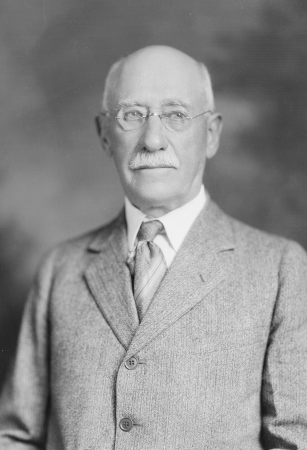 He also served on the Board of Trustees for the University of Wyoming. In the early 1900s, Gramm had a contract with the State of Wyoming to operate the State Penitentiary in Rawlins. For a man held in such high esteem, the conditions in the new prison were less than ideal. Gramm received $.57 per day per prisoner from the state, plus the profits from the facility’s broom works where the inmates worked. The broom works was burned down by the prisoners in 1912. It came to light that the prisoners under Gramm’s charge were given just enough food to prevent starvation. In 1911, Republican gubernatorial candidate Joseph Carey’s platform included the termination of Gramm’s contract, both for cost-saving measures and because of Gramm’s less than savory reputation. Learn more about Otto Gramm.